In the mid-1960’s, William D. Edson and Edward L. May collaborated to produce Locomotives of the New York Central Lines, the first all-time roster ever published of steam and electric locomotives of the New York Central, its subsidiaries, and its predecessor lines. First advertised in Model Railroader magazine in October 1966, this 136-page, soft-cover book included primary data on over 14,000 steam and electric locomotives, with 210 line drawings and diagrams as well as several useful charts. It was offered at only $4.95 postpaid, and it immediately became an important reference for anyone who cared about the history of Central’s steam and electric motive power. The authors of this seminal work were eminently qualified to undertake its preparation. Mr. Edson had had a twenty-two-year career with New York Central in a variety of positions including Chief Mechanical Engineer, and Mr. May had studied, researched, photographed, and documented New York Central motive power as a life-time avocation. The work is remarkably free of errors or omissions, and this writer still finds his copy so useful that it does not ever find a regular place of repose on his bookshelf. By the 1990’s, the Edson-May publication was long out of print and there appeared to be a good market for a more heroic work to include much more data as well as representative photographs. Rising to the challenge, Mr. Edson teamed up with H. Lansing Vail, Jr. in the preparation of a two-volume work that would become the ultimate authority on New York Central steam and electric power. Mr. Vail was one of the founders of and later became the president of the New York Central System Historical Society. 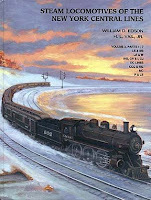 The resulting hardcover Volume 1 of Steam Locomotives of the New York Central Lines was published by the Society in 1997. Basically, it covers locomotives of New York Central lines east of Buffalo. Its title is something of a misnomer, since electric locomotives in classes P, Q, R (but not the Michigan Central R-1’s in detail), S, and T are covered. The title page credits Mr. Edson as the compiler, assisted by Mr. Vail and Mr. May. The second hardcover volume was published by the Society in 2002. It covers lines west of Buffalo: Lake Shore & Michigan Southern, Lake Erie & Western, Indiana Harbor Belt/Chicago Junction/Chicago River & Indiana, Ohio Central, Big Four, Michigan Central, and Pittsburgh & Lake Erie, as well as all of their predecessor lines. The Michigan Central R-1 electric locomotives are also covered in this volume. Mr. Edson is again named as the compiler, assisted by Mr. Vail. Mr. May had died in 1998. For the serious researcher, Volume 2, like Volume 1, stands above the original Edson-May roster book because, in addition to the provision of generalized data for classes or subclasses including wheel arrangement, cylinder dimensions, driving wheel diameter, boiler pressure, weight, and tractive force, locomotive-specific data is also provided including year and month of construction, builder’s serial number, all known renumberings, retirement date, and in many cases scrap date. While the Edson-May book provides general data for groups, usually subclasses, of locomotives, both later publications devote a line to each engine. For example, where the Edson-May book provides the range of retirement dates for LS&MS K-2A engines 4823-4844 as 1929-1936, the Volume 2 roster book gives the retirement date for engine 4823 as July 1934, for engine 4824 as April 1933, and so on. The space required for such detailed information is enormous. What Edson and May summarized with generalized data in 136 pages requires 310 pages in Volume 1 and 428 pages in Volume 2 of the Edson-Vail work. Of course, it must be recognized that Volume 1 and Volume 2 are also profusely illustrated with photographs, whereas the Edson-May roster book features no photos, and the type size is considerable larger in the later books. Also, the reproduction of the diagrams is satisfactory, whereas some of the diagrams in the Edson-May book are so small as to render the dimensioning almost unreadable. Regarding the many photographs and diagrams, their reproduction is first-rate, and there is an abundance of them. Volume 2 contains 672 illustrations, mostly appearing on the right-hand pages of the book. But, like Volume 1, it is much more than a nice picture book. It was never the intention of the compilers, nor of the Society, to publish either Volume 1 or Volume 2 for the picture-book market. Both volumes are invaluable tools for people seriously interested in the motive power history of the New York Central System and its many predecessor lines. The photographs and diagrams provide a pleasing esthetic balance and often serve to illustrate differences between or among subclasses or changes that were made to locomotives over time, but the real merit of both volumes is to be found in the meticulously researched data. Because of the complexity of the subject and the completeness of the book there are times when the old Edson-May roster book can be considerably easier to use. Suppose one wants to obtain an overview of Central’s K-3 Pacifics – when they were built, who built them and for what road, how many there were in how many subclasses, etc. The data appears on pages 123 and 124 of the Edson-May book. It covers K-3’s built for NYC&HR, NYC, LS&MS, MC, and CCC&StL, and it includes references to the transfers made to the Peoria and Eastern and to the Boston and Albany. But using Volume 2 for the same information, it becomes necessary to look at pages 404-405 for the LS&MS K-3’s, pages 552-554 for the CCC&StL K-3’s, and page 646 for the MCRR K-3’s; and then, if it’s at hand, to consult pages 198-203 in Volume 1 for the NYC&HR and NYC K-3’s. That’s a lot of hunting. This is not to say that the by-line, rather than by-class, primary organization of the book ought to have been otherwise. The compilers must have given much thought to the organization and presentation of their data, and it is the opinion of this reviewer that their choice, to divide the book into seven parts, each dealing with a different line, or group of lines, was correct. Much of the material deals with locomotives that predate line consolidation by many decades. And if one wants to follow the development of, for example, Pacifics built for the Michigan Central, the organization, which flows directly from K-80 to K-3 to K-5, makes perfect sense. Steam Locomotives of the New York Central Lines, Volume 1, sold very well, and only a limited number of copies are still available from the Society. Volume 2 will surely be equally successful. The two volumes constitute a complete record of Central’s steam and electric motive power and deserve a place together in the reference library of everyone interested in the history of the New York Central. If you now have one, you ought to have the other. It is regrettable that both Mr. Edson and Mr. Vail died only a short time after the publication of Volume 2. Both men labored diligently to complete the work in spite of developing health difficulties. Taken together, both volumes stand as a fitting memorial to them and to their untiring efforts to preserve for us all a significant portion of the history of our favorite railroad. This entry was posted in Members Information, NYCSHS "Collinwood Shop" Your NYCSHS Hobby Store, Research Information. Bookmark the permalink.